Empower RF now offers the new scalable pulsed L-band amplifier family, ideally designed for fixed gain applications where the operator must have the ability to increase or decrease the output power based on varying the RF input level without having to read output power from costly external DDCs, cables, power meters, and power sensors. These amplifiers include expandable system hardware architecture to save on costs and enable the addition of power amplifier blocks in the future. 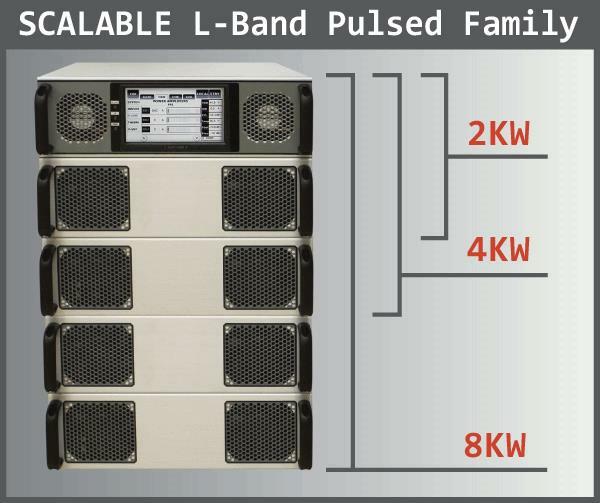 With an operating frequency range of 1 to 2 GHz and 2000, 4000, or 8000 Watts of peak power, these scalable pulsed amplifiers are able to support radar, electronic warfare, and radiated susceptibility. These amplifiers include automatic gain control (AGC) mode for a much flatter response over the entire operating band, and automatic level control (ALC) mode for allowing a system to be built with uncalibrated components. Download the datasheets for more information on the individual models in the pulsed L-band amplifier family.